Larry and I met at a Valentine’s Day dance over 40 years ago. It’s a love that deepens with the years. Hopefully, our story will inspire you to build a stronger and more lasting relationship with the one you love. After retiring from teaching, he has devoted himself to working for organizations such as Habitat for Humanity, Bright Hope, Faith in Action, Love INC and most currently Adaptive Adventures. In the past, Larry managed, with the help of friends and family, to fix up and give away more than 2,000 bicycles. We have always been a team. We have a tandem kayak, a tandem bicycle and I wouldn’t miss a ride on the back of his Gold Wing Motorcycle up to Lake Geneva. This probably is one of the reasons why we are close. We choose to serve together, pray together and play together. Not that we don’t have our problems like any other couple. But our nature is to love and to laugh and it’s hard for us to stay angry for very long. We try to follow what the Bible says. “Don’t let the sun go down on your anger.” Many times we just agree to disagree. We can both be stubborn at times. We look to the Bible for guidance as it is a source that never chances unlike the latest counseling advice. Finding happiness, we have discovered, comes from serving one another and helping others. It once has been said,” A person makes a very small package if he is totally wrapped up in himself.” We both love people, the outdoors, and each other so that is why our latest serving experience is so perfect. It embodies all of our passions. Larry is my trailblazer setting us off on yet another adventure. 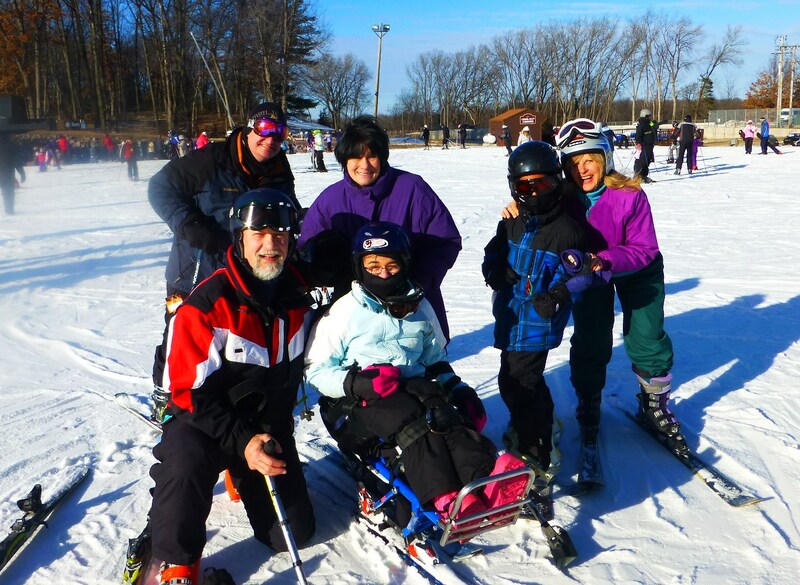 For the past four years, Larry has been an instructor at Wilmot Ski Resort where he noticed a group of Adaptive Adventure Skiers in the cafeteria. Being retired military, he immediately wanted to know how he could get involved helping GI’s returning with causalities from Iraq and Afghanistan. He met Reilly who lost a leg in combat. We were so impressed to see how well Reilly skies and how he teaches others the sport. We knew it was an organization we wanted to get involved in. It wasn’t long before Larry was spending two full days a week helping disabled adults and children. My first experience with Adaptive Adventures was a weekend up at Cascade. I thought I was going to shadow Larry. 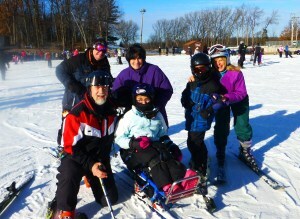 But before I knew it, they had me skiing with Hailey, a legally blind 17 years old. She was so excited to be on the mountain on a warm, sunny day. We talked non stop about her family, school and skiing. As a former English teacher, we discussed The Scarlet Letter, Shakespeare, etc. We talked about poetry slams and decided to write a poem about Jeff, the young man who taught her how to ski. We could only find paper plates and a marker to write our hilarious poems. The most I had to do for Hailey was to take her by the arm as we got off the lift and to guide her down the hill. She did a splendid job avoiding any potential hazards. We came in for lunch and the table looked like something out of a sci-fi movie. It was surrounded with prosthetic legs. I never knew there were legs for skiing as well as legs for walking. Sarah, an Africa American teenager dressed all in pink, just beamed as she smiled at Hailey and me. She and her friend were taking a break from their morning adventure on sit-skies. Yes, a paraplegic can ski while sitting and control the directions. Yes, life with Larry has been full of adventures in our quest to help others and in so doing—-help ourselves.